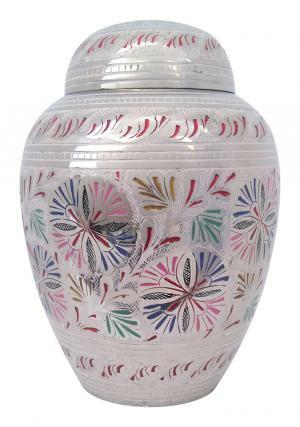 7” Medium dome top colorful floral urn, the medium urn is beautifully presented with engravings of flowers and split color enamel to each individual flower engraved. Medium sized cremation urn is etched with half sphere dome structured top lid with beautifully labelled screw threadings for an easy closure and opening for insertion of the ashes. 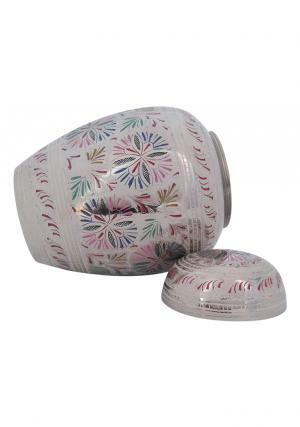 The bands of leaves are well decorated on a nickel finish with an enamel coating of mirror reflection covered on urn and the lid. 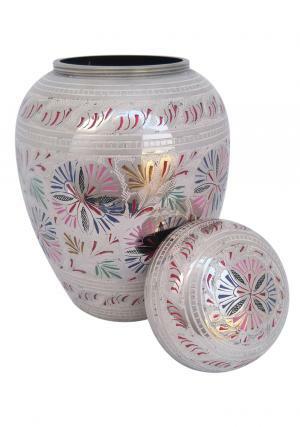 Medium size 7” inch memorial urn is used to store half the ashes of cremated approximately 100 cubic inches and the medium sized 7 inch urn weighs 0.96 Kg when empty. 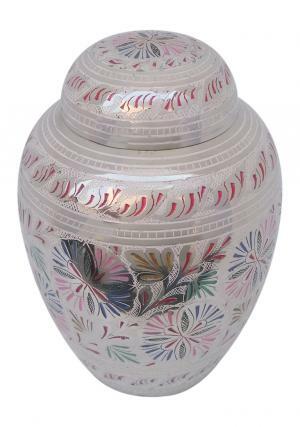 The dimensions of medium sized floral cremation urn are 7.28 inches tall, 5.12 inches in length and width.